Barns, S.M., C.F. Delwiche, J.D. Palmer, and N.R. Pace. 1996. Perspectives on archaeal diversity, thermophily and monophyly from environmental rRNAsequences. Proc. Natl. Acad. Sci. In press. Phylogenetic analysis of ribosomal RNA sequences obtained from uncultivated organisms of a hot spring in Yellowstone National Park reveals several novel groups of Archaea, many of which diverged from the crenarchaeal line of descent prior to previously characterized members of that kingdom. Universal phylogenetic trees constructed with the addition of these sequences indicate monophyly of Archaea, with modest bootstrap support. The data also show a specific relationship between low-temperature marine Archaea and some hot spring Archaea. 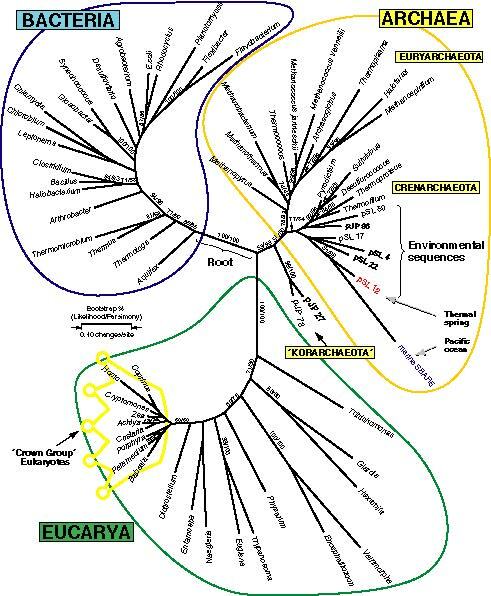 Two of the environmental sequences are enigmatic: depending upon the dataset and analytical method used, these sequences branch deeply within the Crenarchaeota, below the bifurcation between Crenarchaeota and Euryarchaeota, or as the sister group to eukarya. If additional data confirm either of the latter two placements, then the organisms represented by these ribosomal RNA sequences would xcognition as a new kingdom.